Though Clarence Thomas has been a Supreme Court Justice for nearly 25 years and has written close to five hundred opinions, legal scholars and pundits have given him short shrift, often, in fact, dismissing him as a narrow partisan, a silent presence on the bench, an enemy of his race, a tool of Antonin Scalia. And yet, as this book makes clear, few justices of the Supreme Court have developed as clear and consistent a constitutional jurisprudence as Thomas. Also little known but apparent in Ralph A. Rossum's detailed assessment of the justice's jurisprudence is how profound Thomas's impact has been in certain areas of constitutional law—not only on the bench but also even among some of his erstwhile disparaging critics. During his years on the Court, Thomas has pursued an original general meaning approach to constitutional interpretation; he has been unswayed by claims of precedent—by the gradual build-up of interpretations that, to his mind, come to distort the original meaning of the constitutional provision in question, leading to muddled decisions and contradictory conclusions. In a close reading of Thomas's hundreds of well-crafted, extensively researched, and passionately argued majority, concurring, and dissenting opinions, Rossum explores how the justice applies this original meaning approach to questions of constitutional structure as they relate to federalism; substantive rights found in the First Amendment's religion and free speech and press clauses, the Second Amendment's right to keep and bear arms, the Fifth Amendment's restrictions on the taking of private property, and the Fourteenth Amendment regarding abortion rights; and various criminal procedural provisions found in the Ex Post Facto Clauses and the Bill of Rights. Thomas grounds his original general meaning approach in the Declaration of Independence and its "self evident" truth that "all men are created equal"; that truth, he insists, "preced[es] and underl[ies] the Constitution." 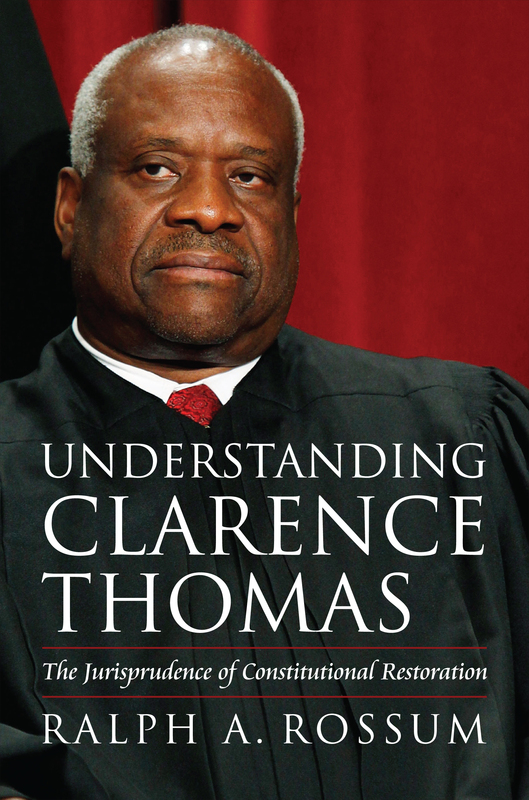 Understanding Clarence Thomas traces the many consequences that, for Thomas, flow from the centrality of that "self evident" truth, and how these shape his opinions in cases concerning desegregation, racial preference, and voting rights. The most thorough explication ever given of the jurisprudence of this prolific but little-understood justice, this work offers a unique opportunity to grasp not just the meaning of Clarence Thomas's opinions but their significance for the Supreme Court and constitutional interpretation in our day. Ralph A. Rossum is Salvatori Professor of American Constitutionalism at Claremont McKenna College. His many books include The Supreme Court and Tribal Gaming: California v. Cabazon Band of Mission Indians and Antonin Scalia's Jurisprudence: Text and Tradition, both published by Kansas.